Many people are forsaking their HIDs lights and switching to the more energy efficient LED options available. Unfortunately, with LEDs, many of them are high quality based on their LED diodes alone. Unlike the HID options from 5 or 10 years ago, no “best” option will fit everyone. Instead, you have to hunt down the LED lights that best suit your needs and your budget. LED lights are quickly increasing in price because of their features, long lifespan, and energy efficiency. LED systems also offer an increase in sterilization which is great for humid climates. The Galaxy Hydro LED systems are known for their long-lasting LEDs and are full of features. The features aren’t always necessary, but many professional growers find them useful. However new growers find them overly complicated. The Galaxy Hydro LED offers a series of features on their systems to lure people in. The best, without doubt, is the dimmer switch which allows you to adjust the intensity of the light. Galaxy Hydro LED’s affordable options offer 1 or 2 dimming options, but their higher end models offer a variety of levels to simulate the light of a day. From sunrise to sunset, the concept here is that simulating the suns natural motions through the sky will lead to better yields and happier plants. The gradual changes you can achieve through the Galaxy Hydro LED top lines can simulate not only a daylight feel but also changes of the seasons. This replication allows a gradual change in spectrum levels and your plants will respond accordingly. Many Galaxy Hydro LEDcomes with a one-switch feature that enables growers to use the grow light easily. The Galaxy Hydro LED has 8 light bands, but they offer a spectrum that includes white and blue light as well as infrared and ultraviolet. This spectrum combination helps your plants through all their lifecycle. The spectrum quality is best explained by acknowledging which LEDs the Galaxy Hydro uses. Because Galaxy Hydro LED uses EpiLED lighting with 3-watt diodes, the spectrum shines with less interference than the lights that use regular LEDs. The light from Galaxy Hydro LED diffuse easily. Many growers in humid environments prefer to have extraordinarily sterile lights. The Galaxy Hydro LED uses a series of ultraviolet and infrared light spectrums which help sterilize the environment. They also promote your plants to grow through the vegetative and flowering stages. Unlike many other LED light systems, the Galaxy Hydro LEDs use only a professional mix of UV and infrared lighting. Some systems now are using too much UV and infrared causing plants to sunburn. The light proportion is incredibly important, and the profession lighting mix you find in Galaxy Hydro LED systems is one of the best proportions you can find. Fans are another important feature available in all Galaxy Hydro LED systems. They keep the entire unit cool which helps the extend the lifespan of the unit as well. This system is the first choice for many new growers. However, it doesn’t quite fit the bill for its price. You can pay slightly more for a much better product, or slightly lower for a very similar product. The Galaxy Hydro 300 has 3 fans, a dimmer switch, and full spectrum lighting. There’s nothing particularly special about this light given its size and price range. 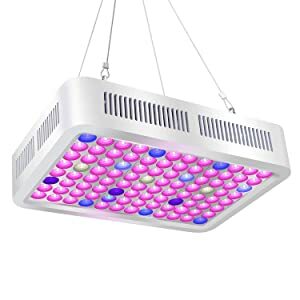 The prize model of the Galaxy Hydro LEDs lower end, this system features a full spectrum while using 2 large fans that operate at high speeds to keep internal temperatures down. The aluminum exterior keeps the system cool as wells. The primary feature that we find from the Galaxy Hydro LED is the UV sterilization. This model is great for beginners or hobbyists. Many professionals desire a timed dimmer, not just a switch, and this shortcoming isn’t’ easily overlooked. The availability of different models from Galaxy Hydro LED is wonderful. However, the 2best selling models are for beginner growers. If you’re looking to choose between the Galaxy Hydro 300 and 600, you’ll get a better bang for your buck from the 600.